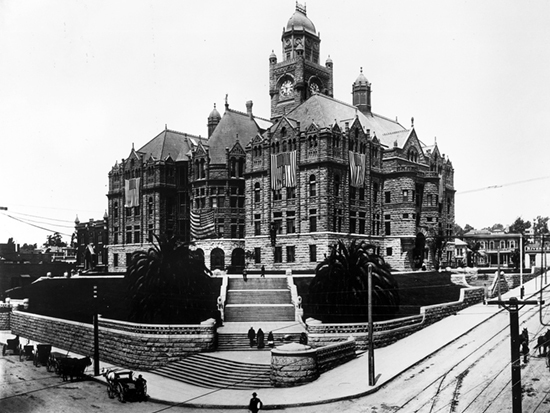 Los Angeles' first building to be built as a courthouse was considered at the time to be one of the West's finest examples of Romanesque architecture. The "Red Sandstone Courthouse" was built at Spring and Temple Streets on what was then known as Poundcake Hill. An outside elevator with windows that was later added to the building became a sightseeing attraction of the city. Damage sustained in the 1933 earthquake made the building unsafe, and it was demolished in 1936. The site is now occupied by the current courthouse.